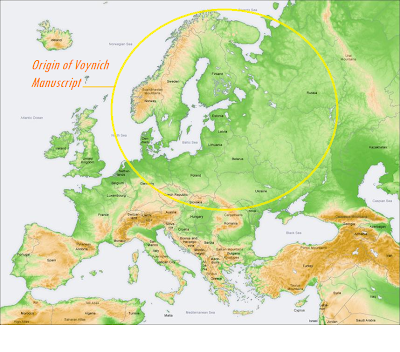 The research outlined below indicates northern Europe as the Voynich manuscript's origin, and it goes further. 2. 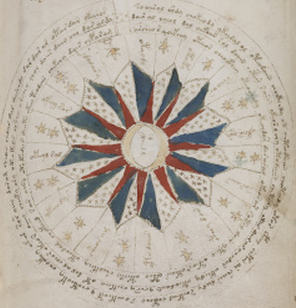 Female suns The Voynich manuscript with its heliocentric star charts was written 105 years before Copernicus’ publication that posited the sun in the center, causing the Copernican Revolution. That's a dead giveaway that the Voynich was created outside of the scientific canon. 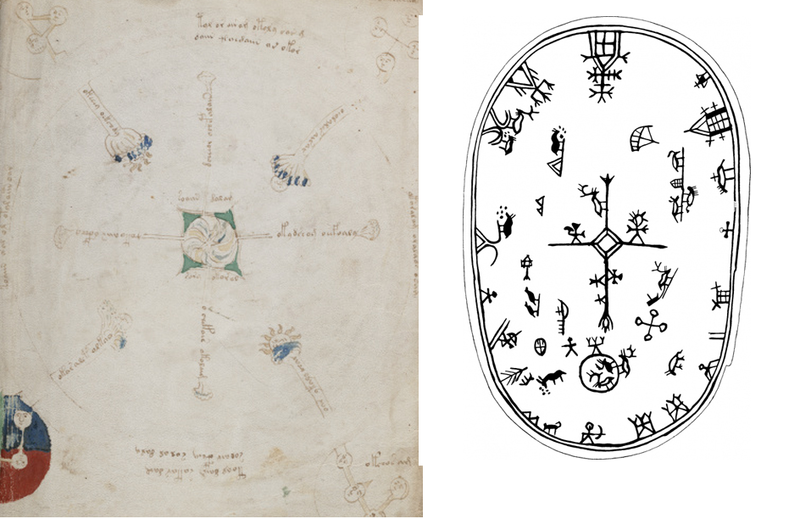 Having little to do with astronomy, the Voynich suns represent some core elements of north European mythologies that can be found in Scandinavian, Finno-Ugric, north Germanic, and even to some extent Celtic traditional belief systems. These belief systems go back thousands of years. 8. 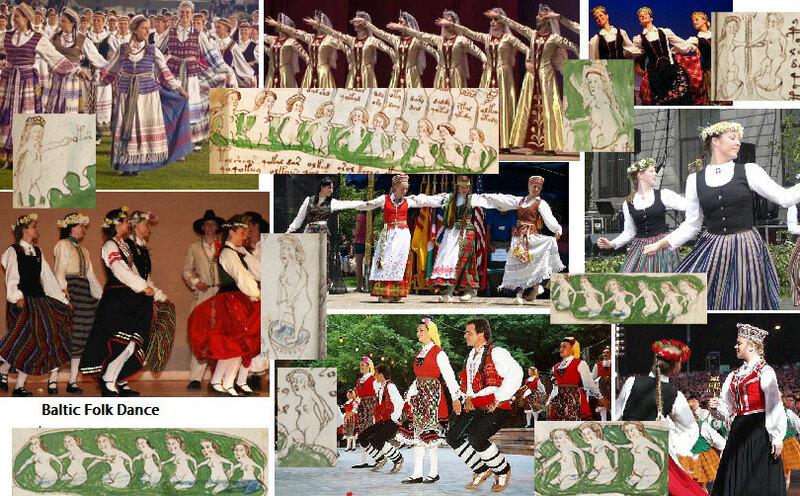 Folk art motifs similar to those found in Karelia and elsewhere in N. Europe, especially Finnic lands. 13. A congruence between the graphics and translations of the text, which speaks of seasonal folk rites within discrete north European belief systems to bring abundance and protection. 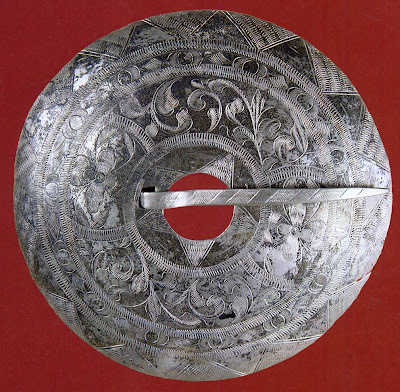 I have observed a connection with fertility in the case of the lizard motif (e.g. Figures 48, 51–52). This fits to the explanation according to which lizard symbolised Earth and the under-world, the world of the dead. From: THE PERMIAN ANIMAL STYLE, Editors Mare Kõiva & Andres Kuperjanov & Väino Poikalainen & Enn Ernits. 24. Labels on herbal jars include a base, a fertility booster, a wound salve, and a medicine for liver. Also, the herbs in the jars, are being identified. 25. Nordic names for women being used in the calendars. 26. 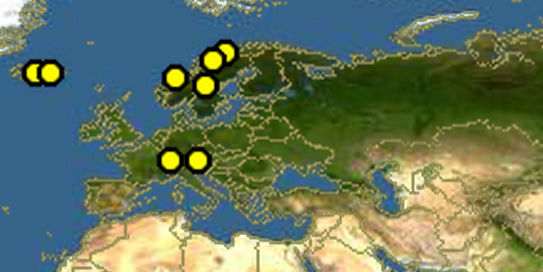 Correspondence with northern European mythic cosmology. 27. Correspondence of handwriting style with another historical document from northern Europe. 28. 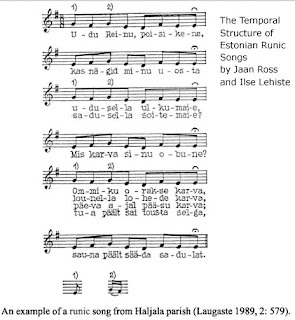 Correlations in phraseology to traditional rune songs and chants that use a distinct meter. 30. A pronounced absence of symbolism that would indicate any other culture. 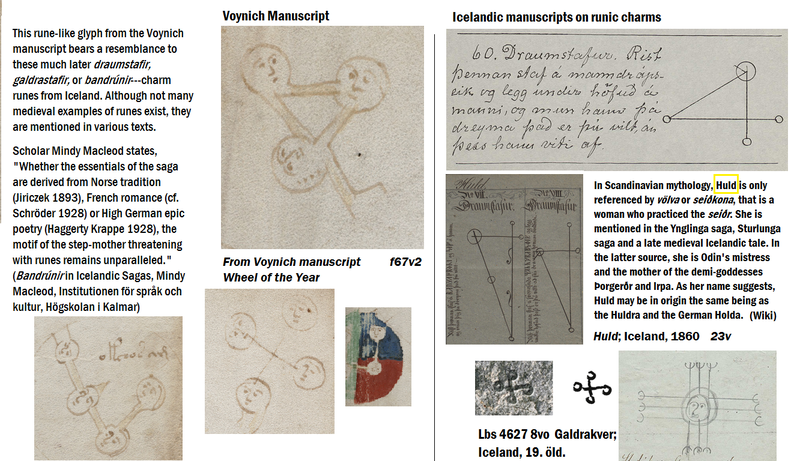 These various elements within the Voynich manuscript all converge on northern Europe as being the origin. 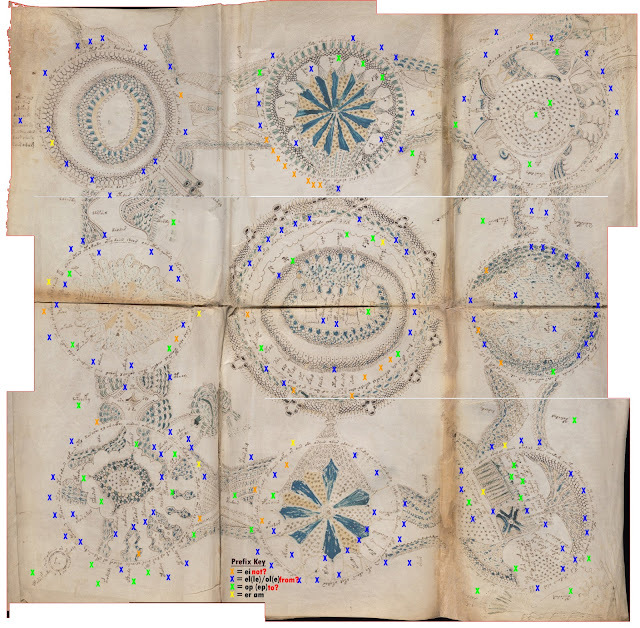 It's pretty fair to assume that the rosette folio in the Voynich manuscript is some type of map. After all, it shows waterways and buildings. At the same time, it has got to be one of the oddest-looking maps ever created. This might be for two reasons. First, as was discussed elsewhere in this blog, the map's structure mimics the framework used to make certain types of lace. Second, as a route map it may depict a journey rather than the simple static topography of a regular map. 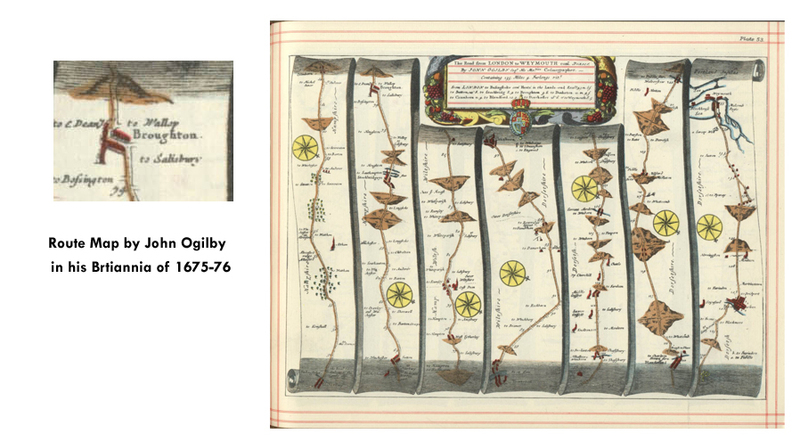 Route maps were used by pilgrims to get to their destination. Below is a typical example. Note that in the English route map by John Ogilby above, place names are preceded by the word "to." In the route map below, centered around Rome, the word preceding place names or routes is "via." If the Voynich manuscript's rosette map is a route map, might it also have some preposition that precedes place names? Place names can easily include prepositions, such as Stratford upon Avon. Germanic languages have in common a two-letter word often signifying to, towards, up, or on. In English, up is still used to mean "further along (in any direction)," e.g., "Go up the street until you see the sign." Similarly, in Middle Dutch, op can mean "in the direction of." Before the 1930s, Norwegian used op as well before changing the spelling to opp. 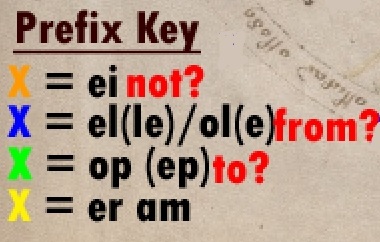 Various languages combine words with prefixes indicating direction, some of them being Hungarian, Finnish of course, Dutch, German, and the Norse languages (Sweden's Uppsala). How prevalent is op as a prefix in the rosette map? To ZOOM IN, right click and bring the map up in its own tab. These received a blue X. Most of them are situated on the periphery of each rosette. In Hungarian, the verbal prefix el- indicates actions whose direction is pointing away from the speaker, either literally or figuratively. Could it be used in this instance to mean "coming from"? Op received a green X. These tended to be closer to the centers of the rosettes. Ei or Oi received an orange X. These could denote whole sides of rosettes, as in the example below. In Estonian and Finnish, ei means "no." Interestingly, the entire lower left of the rosette above repeats, "ei ei ei ei ei ei ei...."
In medieval times, the Black Sea provided a major link between Europe and the Islamic world. From the 9th to the 16th centuries, the Black and Caspian Seas bustled with trade between the two regions... The Black Sea trade routes carried European exports such as furs, amber, and slaves to Asia, while luxury goods such as silks, spices, perfumes, and jewelry moved in the opposite direction. In the 15th century, trade through the region began to decrease as the Turkish Ottoman Empire, which controlled the Black Sea and much of the surrounding area at the time, began to restrict the traditional trade routes, and piracy became more of a problem. Black Sea coast. Azerbaijani Cossacks approaching a Turkish corsair. Finally, the pair of words er am received a yellow X. It occurs here and there on the map. All of that said, I still know neither a) whether the initial letter is an e, o, ø, ó, ò, ő, ö, or ô, nor b) what language Voynichese is. No one knows. I'm simply looking for patterns and resemblances. 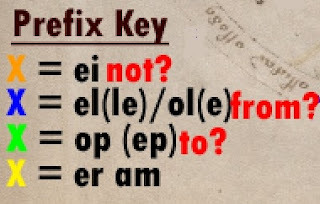 Nevertheless, it's at least a fair guess that since so many words begin with the same patterns of letters, those may be prefixes, and since they occur on a map, these could very well be prepositional, as is the case with the two example route maps. Separating these possible prepositions from what could be the place names may in turn flesh out meaning in the map. The Voynich manuscript has been carbon dated to the 15th century (~1430). 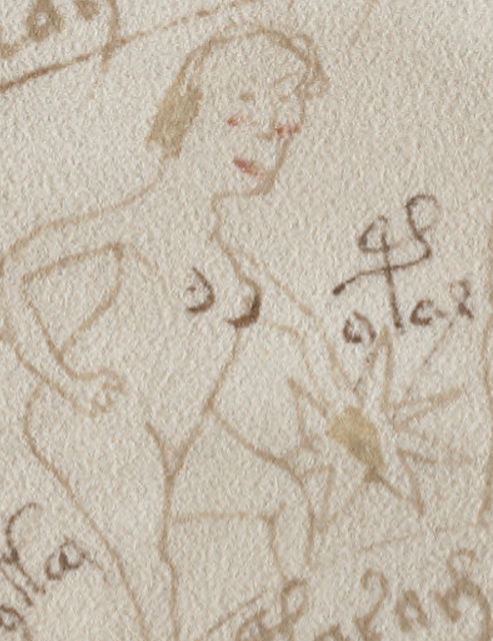 Housed in Yale's Beinecke Library, it depicts largely middle-aged women dancing naked in the water of a cave, and also around star designs and zodiac signs. Other pages illustrate plants and herbal jars. Statistical analysis of the manuscript's text reveals patterns similar to those of natural languages, in fact more complex than English, meaning that it is highly unlikely to be a codified language or a hoax. That much is scientifically proven. 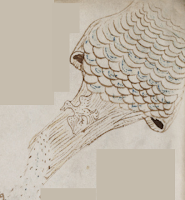 Astonishingly, no one has been able to read the Voynich manuscript or figure out where it originated, who wrote it, or what its purpose was. A progenitor of Scottish Secretary Hand most closely akin to medieval Cornish manuscripts such as the Ordinalia and northern Scottish/Irish manuscripts, including the preserved letter from Robert the Bruce. 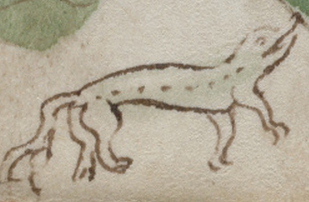 This blog contains a new and original transcription alphabet. A combination of old Finnish and Old Norse with some Slavic, the arcane Kven tongue OR a dialect that evolved where Austria, Hungary, and Croatia meet remain the best bet; however, a plethora of dialects in north Europe, many of them extinct, are viable candidates, perhaps especially dialects spoken around A) Torne Valley and northern Norway; B) the island of Kihnu, Estonia, whose language is a blend of Finno-Ugric and Old Swedish; C) the island of Naissaar, Estonia, when it was inhabited by the aibofolket, Estonian Swedes, in the 15th century; D) the medieval towns of Lohja, Porvoo, and Naantali, or E) the older villages of Karelia. 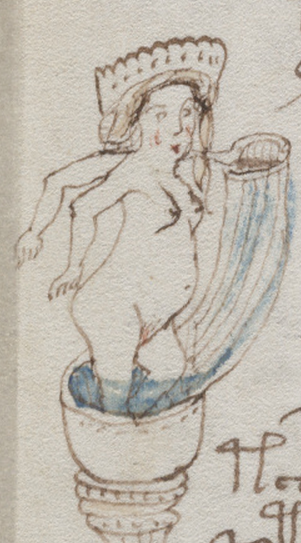 The many women drawn in it, called "nymphs" or elided altogether in other theories, are central instead of peripheral to it. They themselves actually wrote and drew it. They are possibly the legendary Huldra, participants in a Neolithic cult of tripartite Rhea (later [f]Reya), the original Finnic practitioners of what was then appropriated and dubbed by the Norse as Seiðr during the Late Scandinavian Iron Age. In Finland, Estonia, and Scandinavia, the Church later terminated the sacred HIIS and the underworld called Hiiela by substituting the hiis with the Church graveyard. They were healers, herbalists, midwives, brewers, bakers, cooks, spinners, weavers, embroiderers, well-water guards, water navigators, jewelry makers, tradespeople, land owners or birkarls, noblewomen, singers, dancers, and diviners. The manuscript celebrates these occupations. BaltoFinnoNorse poetry and song. 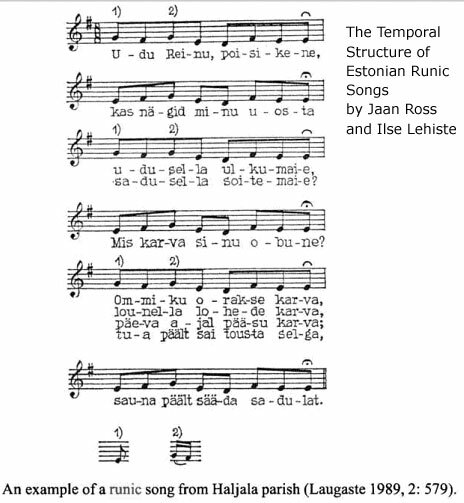 Trochaic chant in the tradition of the great Finnish epics, possibly even in Kalevalan meter itself. Akin to Seto Leiko Hõpõhelme, leelo song, which is said to be able to bring down walls. Alliterative, repetitive, and playful with words. Nonlinear, with depth symmetry, like a joik. The manuscript could in fact be a guide (akin to the zibaldone)--songbook, calendar, and map--for these women to go south on a specific pilgrimage in the springtime, according to an ancient, pre-Christian folkloric belief system, the remnants of which can still be discovered in Europe today. Lofoten, Norway coming around the Gulf of Bothnia to Southern Finland (Naantali, Lohja) and the islands of Estonia, especially Kihnu, are definite candidates with almost as high a likelihood running from the Baltic region down to the Alpine mountains bordering Slovenia/Croatia, Austria, and Hungary. In these areas particularly, a patchwork of the oldest European belief system can be found in remnants, and the Voynich manuscript echoes them. Rosette map contains Fennoscandia, the Baltic, Danubian Europe, Russia's Golden Ring, the Black Sea, Mount Elbrus, and the Urals. 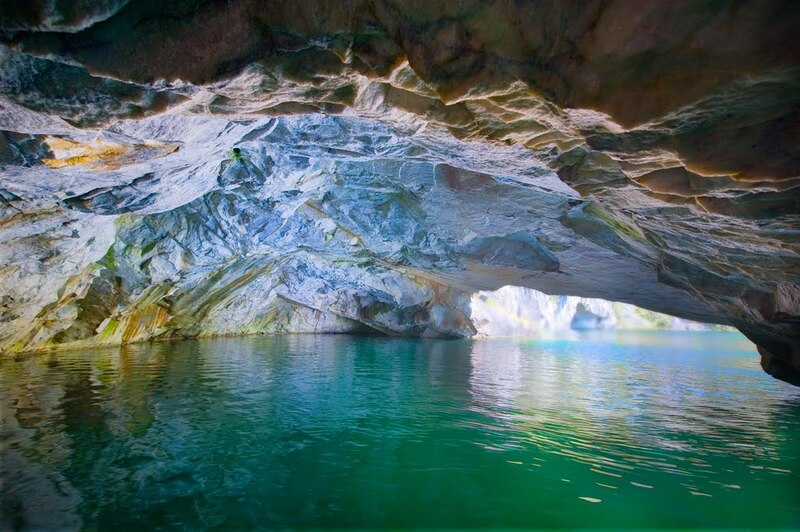 The women were depicting themselves performing a shamanistic water/cave ritual celebrating the sempiternal cycle of nature manifest in the seasons and in the span of human life from birth to death. The backdrop for this ritual is north European (Finno-Ugric) cosmology that reaches back into the Neolithic. Sauna/banya, still enjoyed today, echo these ancient rites, as do pilgrimages to sacred springs that have been in more recent times dedicated to saints, as well as several seasonal festivals, such as one known in English as Twelfth Night. 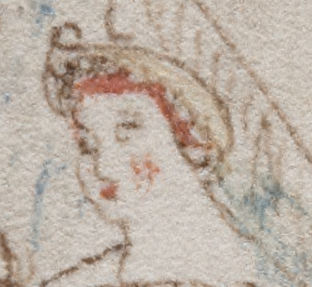 In the center of many of the star charts is a woman's face. 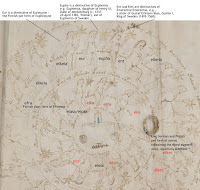 These star charts may depict a celebrated Nordic ancestor (disir) and her descendants (represented by the smaller, surrounding stars) and not astronomical bodies or constellations. Indeed, these star charts resemble the large, circular brooches worn by Nordic women during the phase in their lives when they are fertile. These brooches are often said to represent the sun. 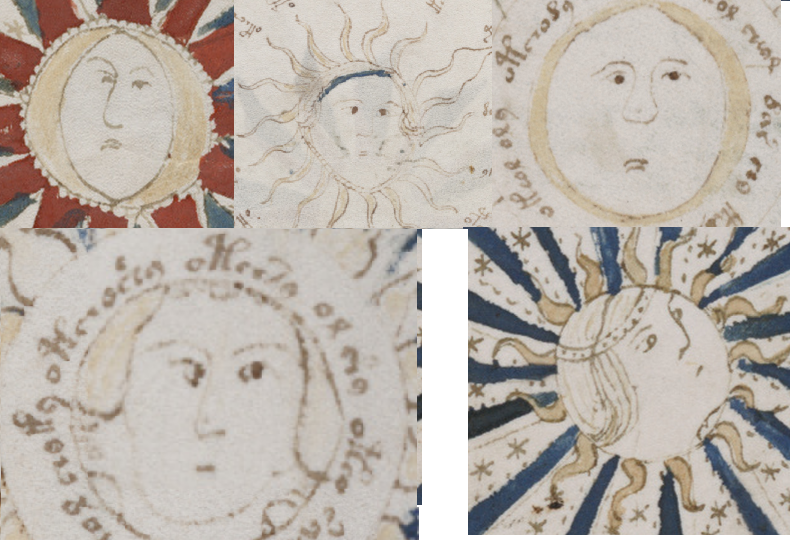 The women's faces in the centers of the star charts often have rays like the sun. These symbols all hark back to an ancient female sky deity celebrated under various names throughout northern Europe. 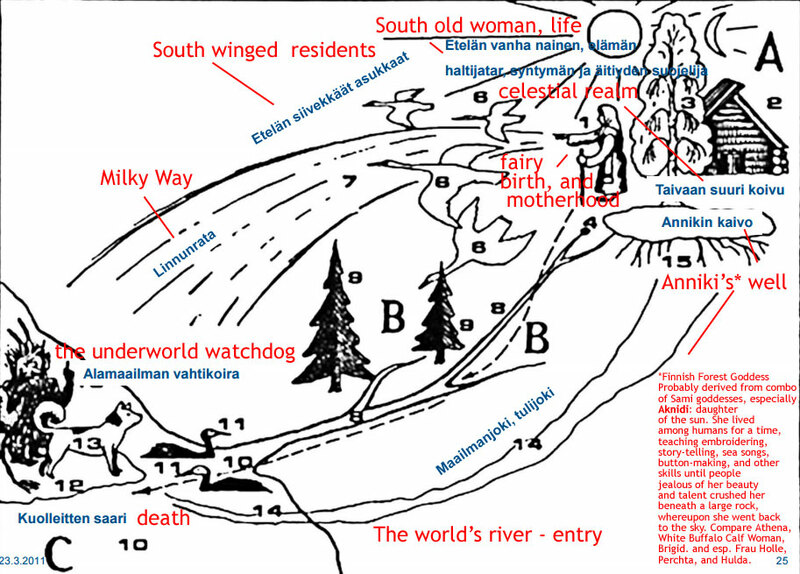 The rosette map in the manuscript records an ancient pilgrimage from Fennoscandia to the Perm in the northern Urals marked by passage via waterways, many of which were subterranean. The blooming of plants on riverbanks beside castles helped pilgrims know when it was time to rendezvous. Stars with their varying numbers of rays may represent acolytes. 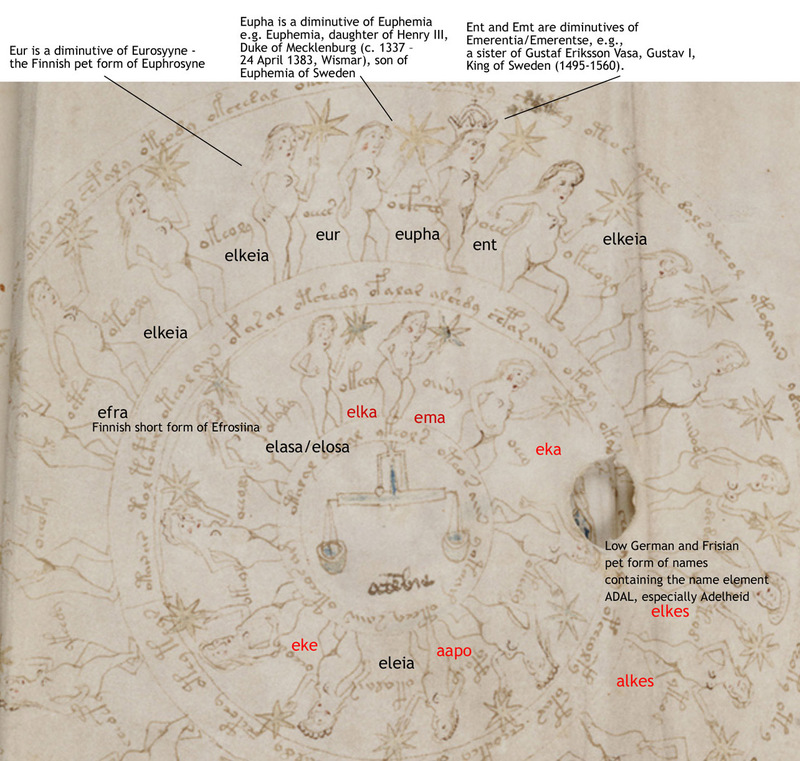 The belief system depicted in the Voynich manuscript was alluded to in sagas such as the Edda. In time it was subsumed under the spread of Christianity and re-emerged as the cult of Mary and Saint Birgitta, which was centered in Reval (Tallinn) though widespread throughout the Baltic region and into Germany. The murals of Saint Lawrence cathedral in Lohja, Finland, serve as a semiotic bridge between the pre-Christian Voynich Manuscript and the more classical, Judeo-Christian iconography of later churches around the Baltic region. As with all shamanism water and caves were main metaphors for travel between life and death. The belief system played out on every folio is a remnant of the Neolithic fertility paradigm that once spanned Europe under names like Freya, Holda, Nerthus, Perchta, Holle, Akka, Rán [raun or raahn], and Frau Gauden. These former deities can be traced only vaguely in their later surrogates--the docile, vapid vessels of the Virgin Mary, Freya, and myriad saints who have taken over wells and springs, etc. In order to survive, the old belief system went deep underground and obviously at some point, and oftentimes with inhuman brutality, died out so thoroughly as to mystify us whenever any actual historical remnant of it gets unearthed. The wisdom throughout the Voynich manuscript is that of the folk. It is not classical, not Judeo-Christian, not Hebrew, not Islamic, not Chinese, not South American, not Arabic, not scientific, not a cipher, not gibberish, and not a hoax. 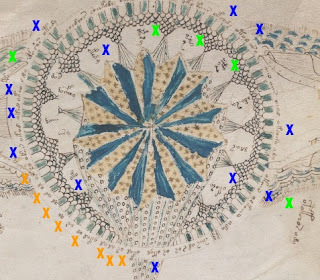 One of the duller attacks made on this theory is that nothing in it reflects any of the current research going on elsewhere about the Voynich manuscript. Indeed, little to no real light has been shed on the Voynich since the statistical analysis and carbon dating. Most certainly this theory is a radical departure from the many blind alleys down which other scholars are still camped. 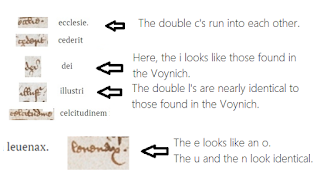 Beautifully, none of the actual science done about the Voynich conflicts with the theory presented here in this blog--not the carbon dating of the vellum, not the consistency of the vellum (more like calf than the goat often used in more southerly locations), not the statistical analysis that suggests that it is a natural language. 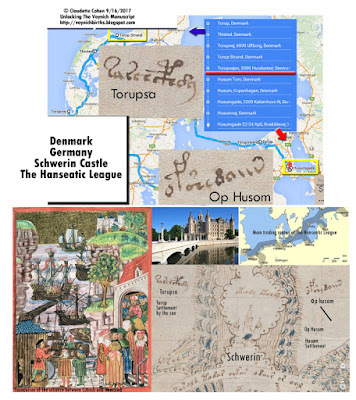 Sauna and Banya, herbal knowledge, embroidery, folk songs, Twelfth Night traditions, lore (fairy tales, myth, and legend, including Tannhauser's), folk design (octogram and kolovrat), coracle design, the shell grotto of Margate, and, oh um, the Voynich manuscript. The herbal jars are treenware, household implements made from wood, often involving being turned on a lathe, further carved, and then painted. 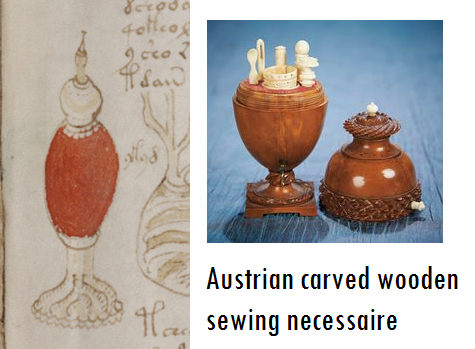 The containers in the Voynich most resemble wooden sewing nécessaires, needle cases, spice grinders and spice towers owned and used by women in their everyday work of cooking, brewing, healing, and sewing from the 11th to the 17th century. The plants in the Voynich are rendered by artists inured in the tradition of embroidery and other women's handicrafts. The flowers are often drawn and painted in a style reminiscent of needlework from the Kihnu and Muhu Islands of Estonia. 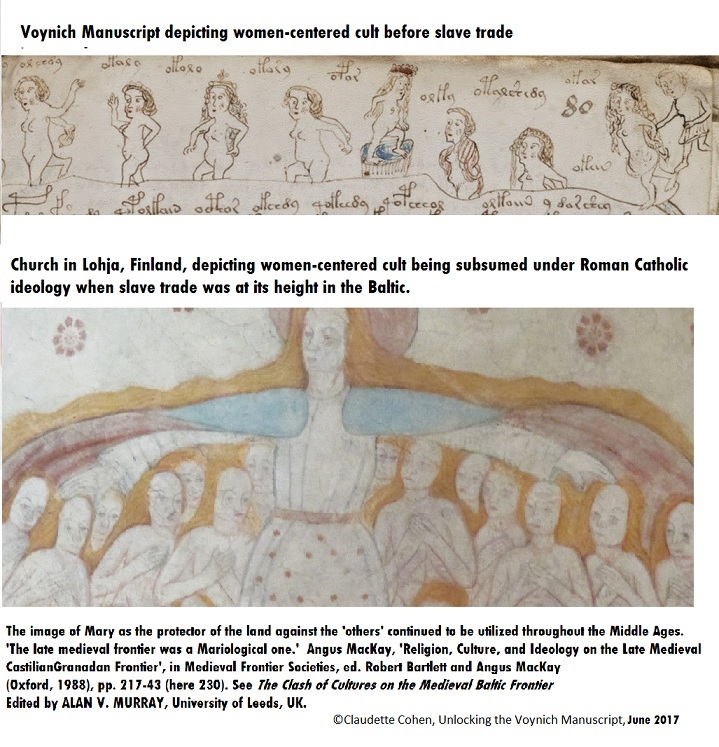 Women in the Baltic region in the late middle ages might be seen as thralled in a catch-22. If they tried to live freely, practicing their rites under no institutionalized guard, they could easily fall prey to the booming slave trade of the times, when word had gotten out that there was a great demand for blond girls in other parts of the world as far away as the Middle East. Trade in blond girls during this time proved very lucrative. The choices for protection weren't many: from the East, the Eastern Orthodox Church; from the West, the Roman Catholic Church often administered under the auspices of the Hanseatic League; from the South limited protection once came from such tribes as the Kumon, who practised shamanism/Tengrism, but even these were branching out and forming alliances with Christianized states; or these women could try their luck hiding out in caves and relying on their own canniness and extensive reputation as sorceresses. The pressures to conform and seek protection must have been intense when many parts in Europe were staging witch hunts in the latter part of the 15th century. By then the Hanseatic League was losing its power. 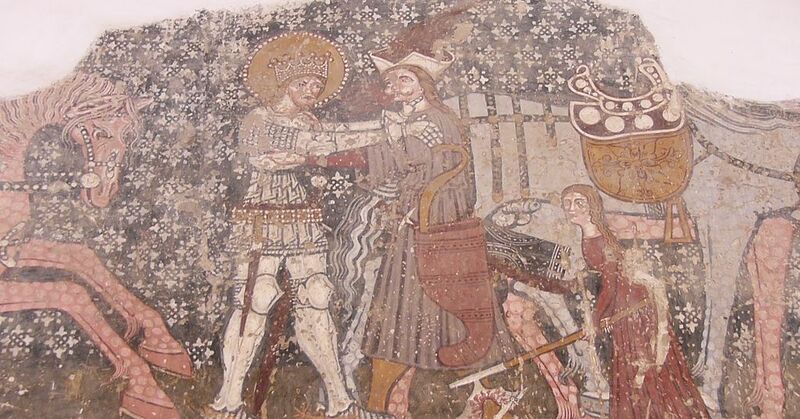 Above: Hungarian King Ladislaus I of Hungary (left) fighting a Cuman warrior (right), from the Székelyderzs (Dârjiu) Unitarian Church, Romania. Most info centers around the two men fighting with identification of the women holding the halberd with a star as simply a girl. She could be a reference to protection from the slave trade or protection of an old women-centered belief system, i.e., paganism. What often happened was that the woman-centered part of belief systems were subsumed under safer cults of the Virgin Mary, with the more pagan vestiges either dying out or becoming clandestine. The most expensive slave on the Caffa register was a 14–year-old white boy referred to in the source text as “Jarcaxius” (“Circassian”? ), who was sold for 750 aspers, and there were other slaves with good colour qualifications that seemed to carry an above-average price. One four-and-a-half-year-old Rus’ian “white” boy cost 185 aspers, although such young children were usually very cheap on account of their high mortality rate. “White” Saracen slaves were also overpriced in the Genoese registers, and blond boys and girls were expensive on the Italian markets, too. 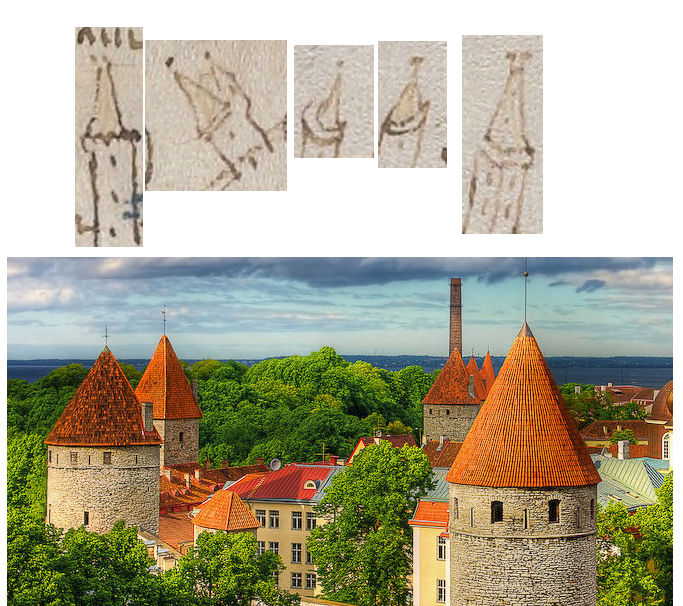 Estonia has the distinction of being a nation where Christianity was held at bay the longest. 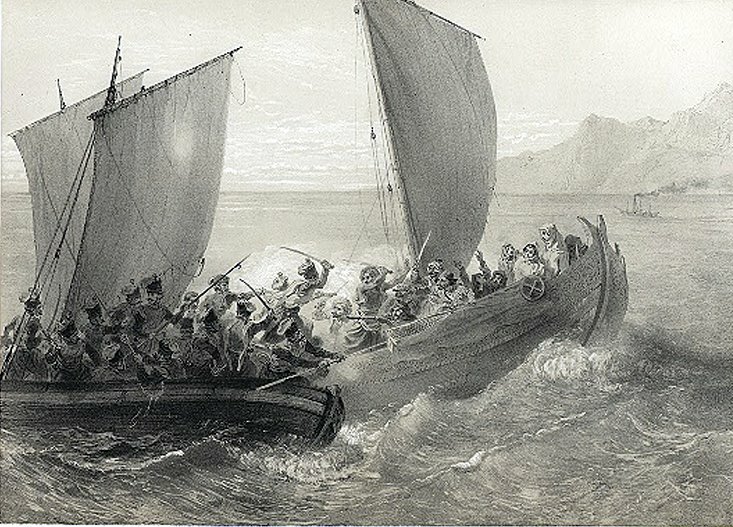 For example, in 1261, warfare continued as the Oeselians (Estonians inhabiting the island Saaremaa) had once again renounced Christianity and killed all the Germans on the island. A peace treaty was signed after the united forces of the Livonian Order, the Bishopric of Ösel-Wiek, the forces of Danish Estonia including mainland Estonians and Latvians defeated the Oeselians by conquering the Kaarma stronghold. Soon thereafter, the Livonian Order established a stone fort at Pöide. The old tradition of monasteries as healing centres continued throughout the late Middle Ages. 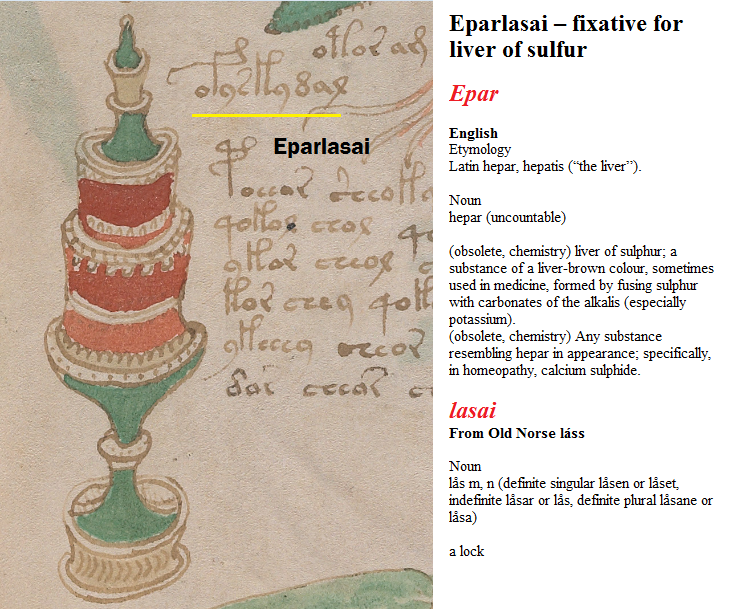 In particular, the ancient learning of herbal tradition was preserved and transmitted in monastic manuscripts," as is exemplified in the chapter of Niiranen, in which the herbal recipes of the monastery of Naantali is analysed. Such learning was not a monopoly of monks and nuns and herbal guide books were used in lay settings as well. During the last centuries of the Middle Ages lay settings became increasingly important in the field of healing, as monasteries lost a lot of their former importance after the birth of universities. From the fourteenth century on, new types of sources such as health books and personal health guides, texts produced mainly for the upper middle class, increased in number. Guide books were composed also by the elite, as McClecry's analysis of the Portuguese king Duarte's (1433-1438) texts, Loyal Counsellor and Book of Advice, reveals. 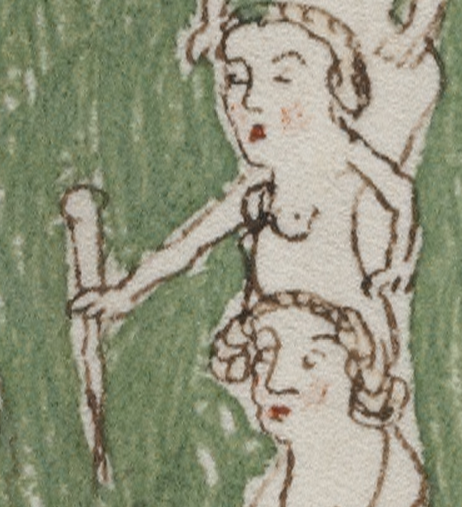 Not only living well but also dying well was in the interest of medieval people; these moral issues were also emphasised in artistic representations, as Sophie Oosterwijk argues in her chapter "This Worlde is but a Pilgrimage': Mental Attitudes in/to the Medieval Dante Macabre." Curiously, despite common beliefs regarding the maladies and generally recommended therapeutic measures, there are not many similarities at the individual recipe level between the five recipe collections, for example the systematic use of a certain plant for a certain ailment. This is due to the fact that medieval materia medica is a very broad tradition, embracing various cultural layers and apparently plenty of regional or even local knowledge. 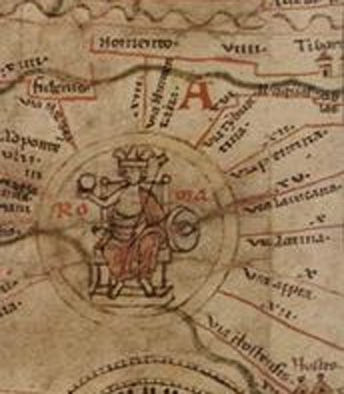 Based on this limited survey, it seems that Hildegard's Physica contains the most divergent sources, probably local in origin and perhaps founded on her personal empirical experience. One suggestion is that she received support from persons who visited her monastery. One such individual was the Swedish Bishop Siward from Uppsala, whose impressive library may have enhanced her medical knowledge. In spite of this possible Swedish-German network, it is hard to see any closer ties between Physica and the Naantali monastery book, though for a more definitive view this topic would require further investigation. Many monasteries did produce and copy various texts, but they could also receive and heal patients in hospices and infirmaries. Medical knowledge was also needed by cloister inhabitants for their own use, especially when physicians were not available, as was the situation in Naantali. The first university-educated doctors apparently did not come to Finland until after the Catholic Era in the sixteenth century. In addition to monasteries and physicians, who increasingly took over the responsibility for curing and healing from monks and priests after the emergence of universities, other professionals, such as apothecaries, appeared on the medical market. All these groups of professional, semi-, quasi- or even unprofessional healers participated in practising, teaching and conserving the art of healing by copying, writing and compiling medicinal texts. To sum up, medieval recipe books from both the South and the North show that when institutional care was limited, recipes provided information, therapies and prevention for men and women regardless of their social group and in the most intimate areas of life too, such as sexuality. In fact some of the baptized went back to their former belief — in lamaism or shamanism; while others made out of all these beliefs the most strange and absurd mixture: ... Double-belief was maintained not only among the nomads, but almost everywhere among my flock .. .
· No one here but us "nymphs"
· Para: An Example of Folk "Magic"
· Who is this woman? The Voynich manuscript has been carbon dated to the 15th century (~1430). Housed in Yale's Beinecke Library, it depicts largely middle-aged women dancing naked in the water of a cave, and also around star designs and zodiac signs. Other pages illustrate plants and herbal jars. Statistical analysis of the manuscript's text reveals patterns similar to those of natural languages, in fact more complex than English, meaning that it is highly unlikely to be a codified language or a hoax. That much is scientifically proven. Astonishingly, no one, expert or amateur, has been able to read this manuscript or figure out where it originated, who wrote it, or what its purpose was. The graphics and weird penmanship invite fanciful speculation which I believe continues to obscure rather than elucidate any real answers. 1. 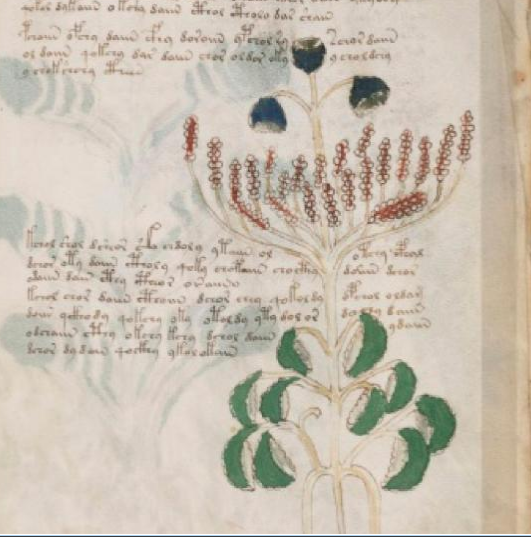 The Voynich manuscript originated from northern Europe. 2. The women it depicts are central instead of peripheral to it. 3. They themselves actually wrote and drew it. 4. They were depicting themselves performing a ritual celebrating the sempiternal cycle of nature manifest in the seasons and in the span of human life from birth to death. I would be happy to answer questions and receive insights. 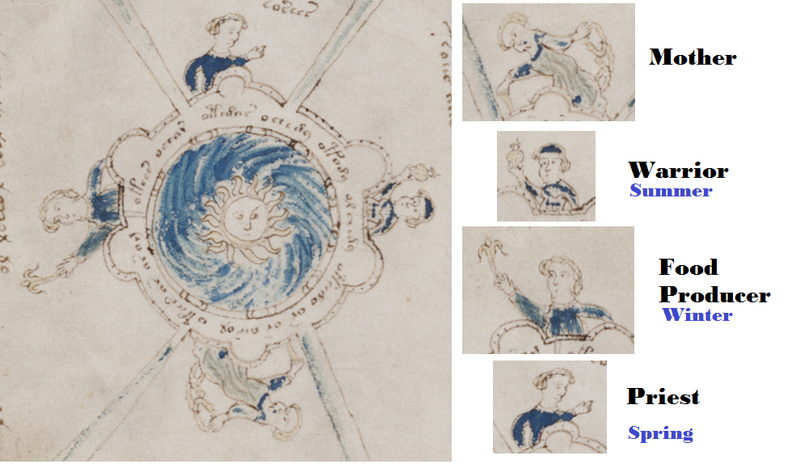 For a comprehensive introduction to the Voynich Manuscript, visit René Zandbergen's site at http://www.voynich.nu. Disclaimer: Most of these graphics are not mine but rather from my research. If you see something of yours that you would like removed, just contact me and I will remove it. 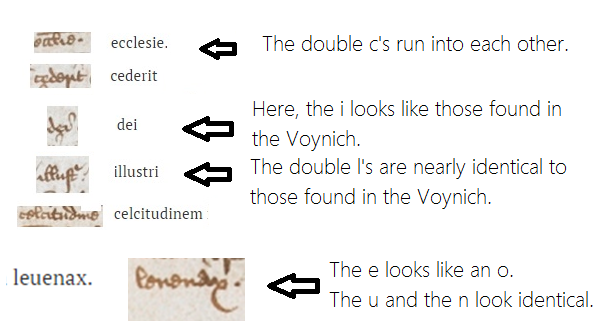 The Voynich Manuscript was written by north Euro. women. © 2014 Claudette Cohen All rights reserved. Simple theme. Theme images by gaffera. Powered by Blogger.